Today I was making some cool baby shower favors and wrapping a few baby-gifts for my niece who is expecting in August. 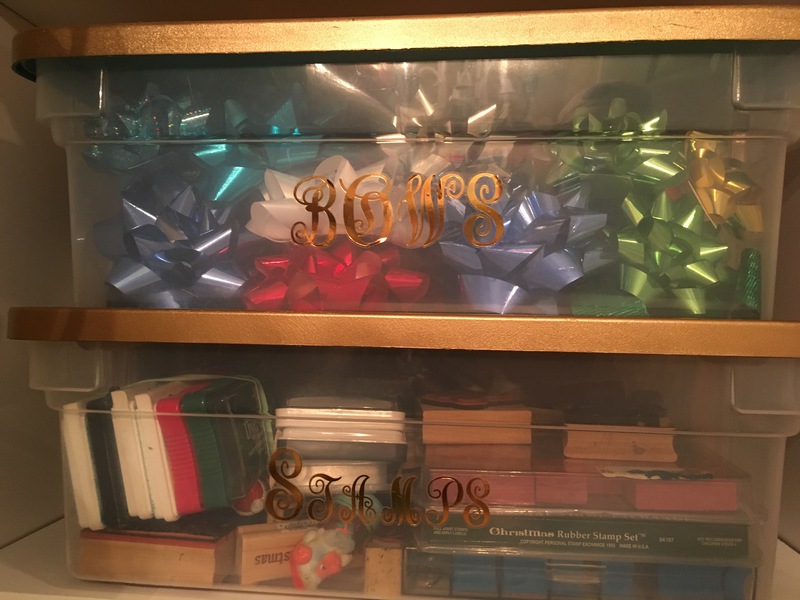 As I was working at my gift wrap station (that I made last Christmas) I noticed how unorganized and messy everything had gotten. I had a hodge podge of plastic containers and the contents had gotten mixed up. Time for a quick fix! I bought a few cans of gold spray paint recently, but hadn’t used them yet! I decided to spruce up the Rubbermaid lids on my containers with some gold spray paint. This was how the shelves in the closet looked before. Most of the lids were white, but a few were blue and green. So, I took off all of the lids and wiped them down and dried them. I set up my spray paint area in the grass. I gave them all a light coat of the gold spray paint. Wear gloves! While I let the first coat dry, I reorganized the containers and added gold self stick letters to each one. I bought the stickers at Michael’s. I added a second coat of paint to the lids and when they were dry, I put them back on each container. I stacked them all back in the craft/gift wrap closet keeping the ones I use the most on the lower shelves. It all looks much nicer and organized. Now I’m tempted to paint everything else in there gold! I gave my gift wrap station a little pick me up too. I had empty rolls of ribbon and paper that I switched out. At the rate time is flying by, Christmas will be here before we know it! For now, I’ll enjoy having my crafts organized and ready. Upcycle a Pickle Jar into a Treat Jar for Your Pets! Quick and Easy Gift Tags! Best Tool for Addressing an Envelope!